Mohamad Hafez’s “Desperate Cargo” hangs from the ceiling. PORTLAND — Immigrants catch flak as strangers and bogeymen. But “Making Migration Visible: Traces, Tracks & Pathways,” at the Institute of Contemporary Art at Maine College of Art, reminds us how common migration is. The exhibition is the cornerstone of a Maine-wide initiative spearheaded by ICA at MECA. More than 70 institutions are offering programming about migration this fall. Curators Julie Poitras Santos and Catherine Besteman have organized a big tent of a show, from wonky data-driven works to expressive paintings. Boston artist Yu-Wen Wu’s “CURRENTS” uses countless red threads to map forced global migration. Iraqi painter Ahmed Alsoudani’s canvases implode in violent gestures, conveying a refugee’s experience from under the skin. Mohamad Hafez tells the story of his Syrian brother-in-law. He crossed the Mediterranean in an inflatable dinghy fleeing the civil war. 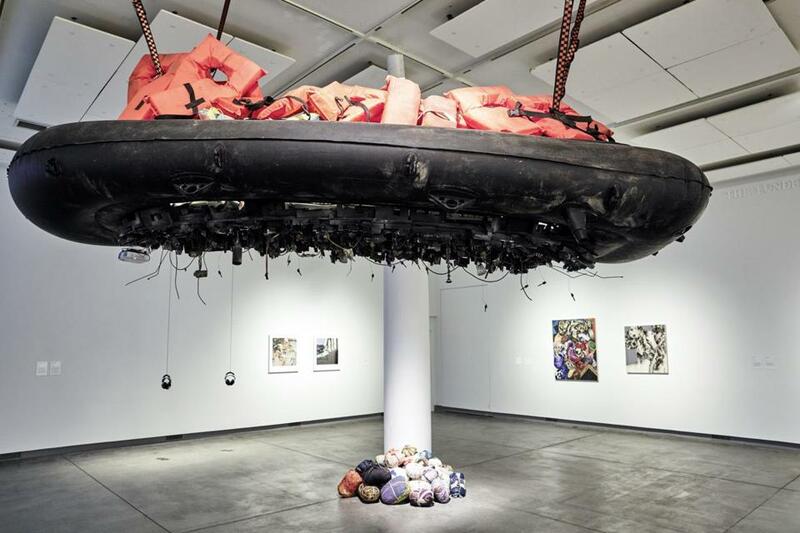 Hafez’s “Desperate Cargo,” a black rubber raft filled with life vests, hangs overhead. A bombed city sprouts beneath it. Lights glow in windows, revealing old photographs, pictures of residents of these buildings. When they had homes. In the installation “Hostile Terrain,” Jason DeLeón, Michael Wells, and Lucy Cahill document the perils of crossing the US-Mexican border, spelling out details of death, survival, and border regulation based on anthropological data from the University of Michigan’s Undocumented Migrant Project. “|At the Periphery|,” Daniel Quintanilla’s virtual reality piece made with UnitedYES and Yarn Corporation highlights immigrants to Maine, farm workers and dishwashers who travel from place to place. Video depicts unpopulated farms, restaurants, and dormitories. But scan the scenes, and barely visible people coalesce and vanish like ghosts. There are more migrants in our communities than we may recognize, this show reminds us. Their invisibility — due to legal status or the desire to fit in, due to our fear or their trauma — makes it easy to overlook and ostracize them. Yet they are intrinsic to our society, and indeed to world history. We might get to know them, listen to their stories. It would do us all some good.